Since the beginning of time Earth has been dependent on the Sun’s existence extracting energy to heat the oceans, drive weather systems, grow plants and enable the existence of all types of living organisms. Humans have for thousands of years taken advantage of the energy from wood, trees and plants and more recently that the fossilized versions in the form of coal, oil and gas. As the human population has exceeded 6 billion, the energy and food chain requirements needed to keep us alive has stressed our planet’s resources. The realization of this coupled with real or artificial scarcity in traditional energy, and power requirements in new environments has pushed many to find new ways to generate sustainable energy devoid of deleterious effects. Hydroelectric power still provides over 70% of the world-wide sustainable energy and about 50% in the US. Recent climate changes have increased the frequency and longevity of droughts and has reduced the amount generated forcing additional capital investment. Fortunately solar energy have begun to fill the void created and helped to expand the amount generated in a significant way. Solar voltaic – which directly converts light into electric current. The first attempts to harness electricity directly from light occurred in the first half of the 19th century when the French scientist Edmond Becquerel discovered that electrolytic cells exposed to light could generate voltage and current. In the later part of the century the first array of cells was demonstrated in NY with a 1% efficiency. In 1954 Bell lab scientists created the first silicon based solar panel that could power equipment. With a conversion efficiency of 6% these had immediate use in Satellites. Vanguard 1 was the first satellites to use solar power ( all of 1 Watt) to power radios. In 1957 Hoffman Electronics designed 8% efficiency panels, 10% in 1959 & 14% in 1960. In 1993 Pacific Gas & Electric became the first U.S. utility to support “distributed systems” with a 500-kW PV array in Kerman, California. In 2008 worldwide solar PV installations surpass 1 GW. The United States alone hits 1 GW in 2008 and surpasses 25 GW in 2015. In 2005 the Federal government created a 30% federal investment tax credit (ITC) for residential and commercial solar energy systems which has been renewed several times and is still with us. In 2007 Nanosolar ships the first commercialized thin-film modules which was the world’s lowest-cost solar panel at the time at $0.99/W. In 2011 the Department of Energy’s SunShot Initiative sets a goal for solar energy to become market-competitive with traditional forms of electricity by 2020. The goal sets targets at 10-cents/kWh for residential, 8-cents/kWh for commercial and 6-cents/kWh for utility-scale PV. This was achieved 3 years early in 2017 when the installed cost of solar dropped to $ 2.80/Wdc for residential and about $1.08 for large fix-tilt systems. A 7- 15 % reduction from the previous year! 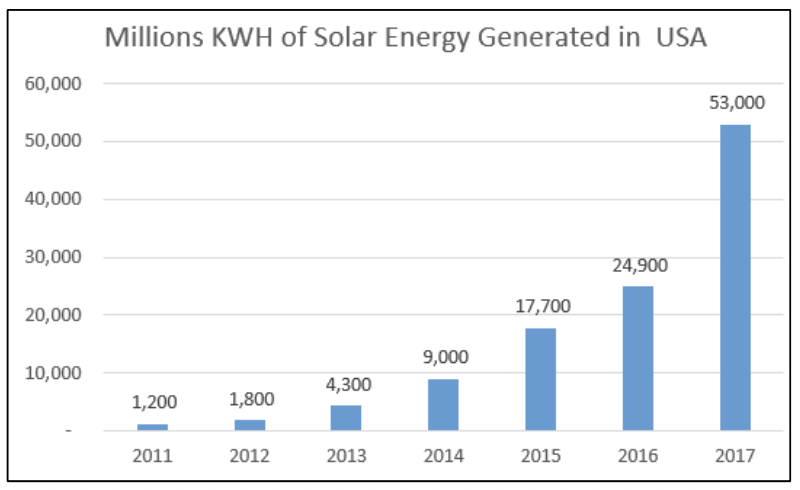 The typical solar panel installed in 2017 was about 21-25% EFFICIENT. The Future for Solar Energy is bright! The convergence of AI and nano-techologies, coupled with electrical storage is delivering a variety of new exciting opportunities. The future will be one of embedded solar arrays in windows, building materials, road surfaces etc, that will incorporate distributed electrical generation without adverse visual pollution. Batteries to store clean energy for later use are improving at an exponential rate and our entire grid infrastructure is moving to distributed generation foregoing the need to build fossil fuel or Nuclear plants while improving reliability and redundancy.